All we know there are lot of duplicate files which consume lot of spaces on your phone memory. You can easily search and delete duplicate files on Android phone. We have lot of images, media files, document file and many more on your device. We have received lot of duplicate files from different social networking websites or other sources. These files not only reduce storage space of primary memory but also reduce your phone performance also. At present time smartphone is an important part of our life. There are lot of latest technology smartphone comes in the market. These smartphone provide latest features which are useful for your daily routine jobs. You can check after some time your latest technology smartphone generate hanging problem or other issues. Most of the person want to know why your phone does not working properly or why hanging problem generate in your device. There is lot of big issues behind this reason. Duplicate files on Android phone is one of the major reason behind this issue. Most of the time you get duplicate images, media or document files from WhatsApp, Facebook or any other source from your friends. These duplicate files not only occupied lot of space on your phone memory but also reduce your phone performance. Due to these duplicate files your smartphone goes slower and not working properly. To resolve this issue you must need to search and delete duplicate files from your Android phone. There are different ways from which you can scan you device to find the duplicate files. You can search all duplicate files and delete them from you device. In this guide we have to discuss how to search and delete duplicate files from you Android phone. 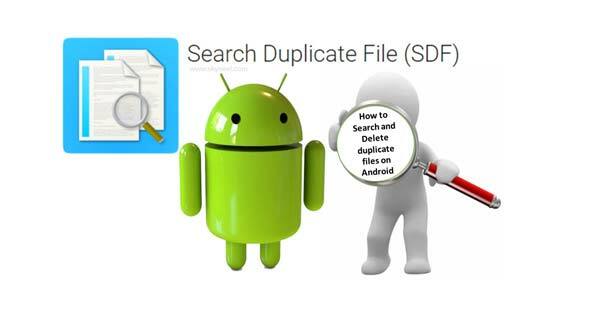 You have to take help of Search Duplicate File (SDF) app from Google Play Store to resolve your problem. If you want to search and delete duplicate files on Android phone then you must have to take following given steps. Step 1: Open Google Play Store on your device and search Search Duplicate File (SDF). Step 2: Download and install Search Duplicate File on Android app on your device. This app occupied 1.35MB space on your device. Step 3: After finish the installation open this app and click on the search button. Now you can check scan process is begins. After finish the searching process you can get all duplicate files on Android phone. You can delete them from your device as per your need. I hope this delete duplicate files on Android phone article helps you to quickly search and delete duplicate files on Android phone. If you have any query regarding this guide then send your message via comment box.